PACK EXPO is a terrific, annual venue of new packaging film and substrate introductions, and (per usual) this week’s event in Chicago didn’t disappoint. Here’s a few of the many new materials available to converters to create tomorrow’s winning packages. 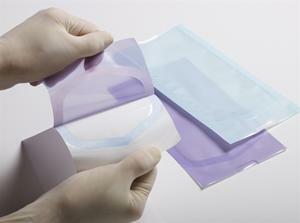 ExxonMobil Chemical introduced four films for a range of flexible packaging and labeling applications. Among them: OPPalyte™ 42 WOS-RH film (see above) reportedly improves operations and cuts total cost of use for frozen novelty food packaging. 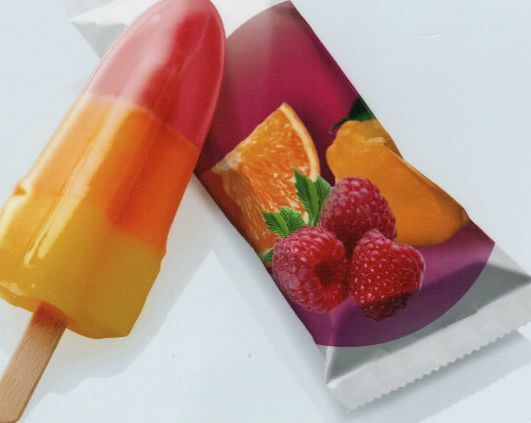 It provides for glossy package designs to attract consumers and is engineered with proprietary surface technology for better machine performance in highly variable relative humidity (RH) conditions encountered in frozen novelty food plants. Other items: Metallyte 70MET-HB2 vacuum-metallized OPP film with enhanced barrier properties; Bicor™ 18MAT-S one-side matte finish, one-side treated, heat-sealable OPP film for reduced package weight; and Label-Lyte™ 50TD200 shrink-sleeve film to help flotation separation of the label from bottles in PET-bottle recycling ops. 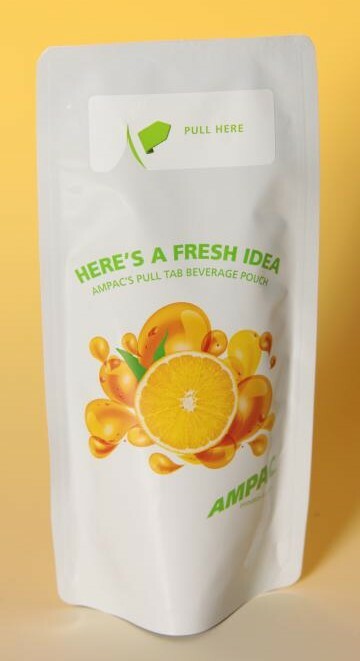 Ampac has added reclosable zipper Inno-Loks® and Pour & LokTM, a foldable zipper applied to film in the side-gusset area of a package, to its capabilities. The company also introduced its Pull Tab™ beverage pouch (at left). The development is an alternative beverage-pouch format to traditional straw punch-through beverage pouches. The Pull Tab experience is said to provide hygienic protection of the straw hole with a tear-away label. A customized straw size is then inserted into the hole. Clear Lam Packaging signed an agreement with Toyota Tsusho Corp. to launch renewable, bioplastic rollstock. Rollprint Packaging Products’ new patent-pending Chameleon™ color-changing tech for heat-seal apps (at left) can be applied to any thermally-stable web including polyester, nylon and PP. A year in development, Chameleon lets a film of one color transfer a peel indicator of a different color to provide a strong visual indication that a package has been opened, thus enhancing product security and helping to deter counterfeiting. Chevron pouches and lidding for trays are expected to be the first commercial end uses. Klöcker Pentaplast added Pentaform® SmartCycle® TH-ES100 PET films made from 100% post-consumer recycled (PCR) content to its lineup. Intended to help converters and their customers meet sustainability goals for visual packaging apps, the material is said to be ideal for face-seal, tray and trapped blister thermoformed containers. Cloud Packaging Systems and MonoSol launched a way to package foods in edible, water-soluble film packets using MonoSol’s new Vivos™ Edible Delivery System. 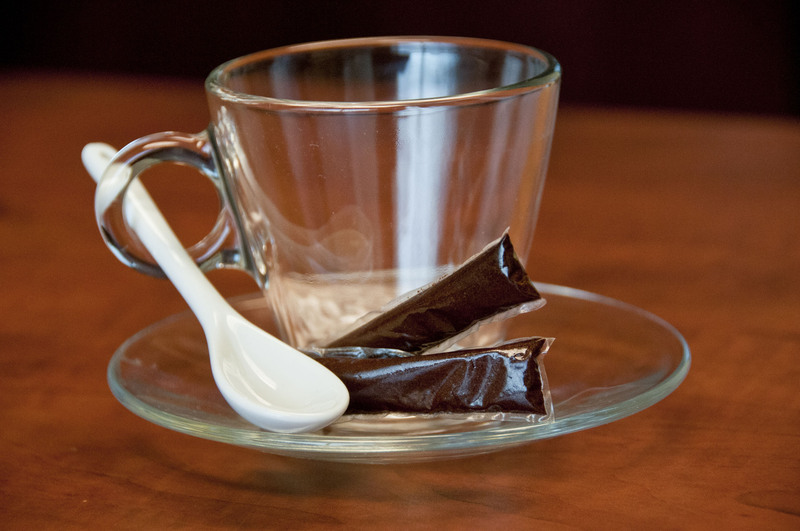 Pouches engineered from Vivos™ films disappear and release their contents when exposed to hot or cold liquids; the dissolved film can then be consumed along with the food. Composed of a proprietary blend of food-grade ingredients, Vivos film is transparent and has no smell or taste when consumed. It reportedly offers a good oxygen barrier and has robust mechanical properties that enable real-world apps with a variety of foods and dry beverage mixes such as instant coffee and cocoa. And where would films be without adhesives to laminate them into even better packaging structures? H.B. Fuller Co. expanded its Flextra® family of flex-pack laminating adhesives with a product specifically for large standup pouches. The solvent-free adhesive strengthens the overall pouch structure to reduce supply-chain damage from bags splitting when dropped during distribution and consumer handling. It fits bag applications for heavier, high bulk-density goods such as pet food and garden supplies (up to 50 lbs.). The new Flextra adhesive tech can also potentially be formulated as a water-based or solvent-based solution. of attendees who didn’t make it due to Hurricane Sandy. The lack of a co-located CPP EXPO, which has now moved to run alongside PRINT 2013, didn’t dampen attendance much, and there was still plenty to interest packaging converters with related exhibitors sprinkled across all four show floors. This entry was posted in coating/laminating, flexible packaging, labels, sustainability and tagged bioplastics, converting, flexible packaging, labels, Pack Expo, packaging, paperboard packaging, plastic film, recycling, source reduction, sustainability, technology. Bookmark the permalink.